ESSENCE conducts research and provides research training in various aspects of translating human capabilities for negotiating meaning to open computational environments such as the web, multi-robot systems, and sensor networks. 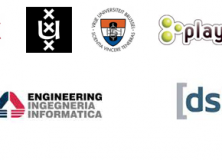 The network will support 15 pre- and post-doctoral fellows who will work toward a set of different research projects within this overall theme, ranging from symbol grounding and ontological reasoning to game-theoretic models of communication and crowdsourcing. Early-Stage Researchers must, at the time of recruitment by the host organisation be in the first 4 years (full-time equivalent research experience) of their research careers, and not yet have a doctoral degree. Experienced Researchers must (at the time of recruitment by the host organisation) be in possession of a doctoral degree, or have at least four years of full-time equivalent research experience, and have less than five years of full-time equivalent research experience (including time spent on doctoral research). For both categories, research experience is measured from the date when they obtained the degree which formally entitled them to embark on a doctorate. All positions are very competitively remunerated (significantly above the respective average national salaries/studentships for pre- and post-doctoral positions) and aimed at outstanding candidates. Please consult the individual descriptions of projects at http://www.essence-network.eu/hiring for detailed salary information. The ESSENCE network aims to attract 40% females among the recruited researchers. Female applicants are explicitly encouraged to apply and treated preferentially whenever they are equally qualified as other male candidates. The ESSENCE network will encourage flexible working hours at each host institution and/or the opportunity to work part-time from home if necessary. ESSENCE will provide specific support for female researchers in terms of targeted training events and dedicated mentoring. All applicants are asked to pre-apply at http://www.essence-network.eu/hiring. Please contact Dr Michael Rovatsos (mrovatso@inf.ed.ac.uk) for informal enquiries.